For the past 3.8 billion years, the geochemistry of the Earth's surface - its atmosphere, waters and exposed crust - has been determined by the presence of biota. Photosynthetic organisms exposed the Earth's surface to oxygen, denitrifying bacteria have maintained the nitrogen concentration in Earth's atmosphere, and land plants have determined the rate of chemical weathering. 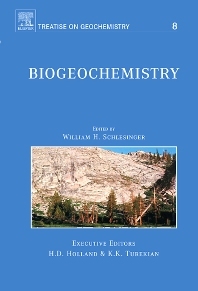 Life determines the global biogeochemical cycles of the elements of biochemistry, especially C, N, P and S. Volume 8 traces the origin and impact of life on the geochemistry of the Earth's surface, with special emphasis on the current human impact on global biogeochemical cycles. The origin and early history of life on earth (E.G. Nisbet). Evolution of metabolic pathways (K.H. Nealson). Sedimentary and molecular biomarkers (J.M. Hayes). Biomineralization (H.C.W. Skinner, A.H. Jahren). Biogeochemistry of primary production in the sea (P.G. Falkowski). Biogeochemistry of terrestrial primary production (F.S. Chapin, III, V.T. Eviner). Biogeochemistry of decomposition and detrital processing (J. Sanderman, R. Amundson). Anaerobic metabolism and the production of trace gases (J.P. Megonigal). Geological history of the carbon cycle (E.T. Sundquist). The contemporary carbon cycle (R.A. Houghton). The global oxygen cycle (S.T. Petsch). The global nitrogen cycle (J.N. Galloway). The global phosphorus cycle (K.C. Ruttenberg). The global sulfur cycle (P. Brimblecombe).